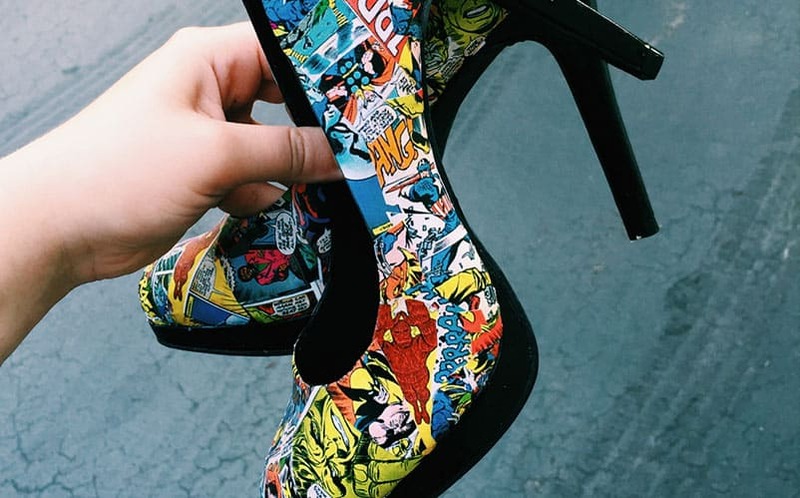 Marvel Comic Book Pumps | Nerd Much? The great thing about comic books is that there’s literally something for everyone. Whether you’re a Marvel, DC, Image or Dark Horse comic book lover, it’s easy to appreciate what each brand has to offer its readers as far as diversity is concerned. But whatever your reason for loving comics is, there’s a ton of great ways to show your support for the culture. Take these Marvel Comic Book Pumps, for example, which are plastered in various Marvel Comics. Each pair is unique, and is hand decorated. The heel has a round toe, padded footbed, and a 4″ heel with a 1/2″ platform. What’s more, the designer will create custom designs just for you if you’re looking for a specific design, theme or character. Personally, I’d go with an all-green Hulk edition. Usually, we tend to go gaga over comic book-themed t-shirts, but once in awhile we come across some cool nerdy accessories we just have to share. For more cool stuff you don’t need to buy, stay tuned to Nerd Much.